Peace is a good thing. God is described numerous times throughout the Biblical text as being a proponent of peace (Psalm 34:14, Isaiah 9:6, 1 Corinthians 14:33, etc.). Yet carnage, death and destruction also find their place within the Biblical narrative; many times the same God who claims to be the “prince of Peace” mandates violence. The most startling and significant of these examples was when God allowed his own Son to be crucified. Violence- it would seem- can be and has been utilized as an instrument of God’s wrath. Thus a Christian who claims or asserts “peace” as an end goal is entirely misguided. Which is why I’m a pacifist. On the one hand, this seems like a paradoxical statement. But if we examine the Biblical text we find that peace is not an end in and of itself. The (albeit, prominent) role of peace throughout the Biblical narrative is as a means to a greater end: that end being God’s glorification. For God is a God who “makes wars cease to the ends of the earth” in order that he “…will be exalted among the nations” (Psalm 46:9-10). The Psalmist does not desire peace but rather acknowledges it as an earthly testimony to God’s Lordship. God’s glorification is the chief end and purpose of not only the Biblical narrative but also the individual Christian life and corporate aim of the Christian Church. Which is why I should specify in saying: I’m a Christian pacifist. Just War Theorists excuse warfare as a necessary evil for the sake of peace. Under this view, war can be justified when its end is clear, its authority legitimate, all other options are exhausted and there is civilian or noncombatant immunity. In other words: if peace is accomplished, the violence must be regulated but can be justified. The problem with this theory is clear. As Professor of Theological Ethics Dr. Daniel M. Bell states: “one would have to search long and hard to find a war whose supporters did not claim their cause was just.” Hence: World War II was a war against a genocidal regime; the war in Iraq was a preemptive strike necessary for the stability of the Middle East, and so on and so forth. The pacifist counter to this proposition is that it’s plainly (and cruelly) ironic: following the nuclear bombing of Hiroshima, the entire city was flattened. At that point, there was no violence. But everyone was also dead. To call that ‘peace’ is just absurd. Peace must be attained- and can only be attained- with the absence of violence entirely. But arrival at the latter conclusion brings a dilemma for the Christian Pacifist. Because one cannot argue that God is only a God of peace. Granted, Christ told Peter to put his sword away (Matthew 26:52) which the church father Tertullian took to mean that Jesus “in disarming Peter, unbelted every soldier.” But, then again, the Israelites committed God-ordained genocide against many of their pagan enemies. And Christ also said he did not come to bring peace but the sword (Matthew 10:34). Lastly, we cannot deny the fact that Christ’s sacrificial purpose was centered on an act of violence- albeit as a recipient of violence- but violence nonetheless. For a Christian, any theology in which peace is held up as the supreme end, whether directly or indirectly, cannot hold water. The pagan pacifist worships peace but for the Christian pacifist Christ is the king. Therefore, Christian pacifism cannot be presented as different words plugged into the same rhetoric as our secular counterparts. Which, all too often, it is. The result is Christian pacifists bowing not to a God of grace and justice, of wrath and compassion, but to a one-dimensional God of peace. In other words, we must understand that God is the God of peace, but he is also much more. And so the Christian pacifist acknowledges the nuanced possibility that God can and does utilize violence in his name. The Christian cannot implement pacifism for the sake of maintaining a utopian ideal. Rather, nonviolence needs to be adopted and preferred by Christians as a way of proclaiming Christ and his coming kingdom. As such, Christian pacifism sees the violence and massacres of the Old Testament, not in juxtaposition to the New Testament, but as a dark foreshadowing of the wrath of God to be poured out upon sin and death itself, a judgment that is borne by Christ on the Cross. In seeing such continuity, there is no disparity in a God of the Old Testament who executes his judgment through the nation of Israel and a God of the New Testament who takes the sin of the world on and usurps it through the most inconceivable of means- beating death at it’s own game, rising from the grave on Easter morn. What the Biblical narrative points to is that Christ’s defeat of death also defeated the purpose of violence and death in his inaugurated kingdom. Christ defeated death so the Christian might proclaim its end. For the Christian to claim otherwise is a denial of Christ’s opposition to sin on the cross. As a result of Calvary, human instigation of violence can no longer be excused as a Biblical notion; it does not embellish the continuity of the Biblical meta-narrative but breaks from it almost entirely! As Christians, the story we tell has to be centered on the cross, the cross that commissioned Christianity with the glorious task of proclaiming Christ as King against which sin, death, violence and destruction cannot stand. In light of this reality, for a Christian to perpetrate violence against another human being is contradictory to our Christian nature. We may excuse the violence as a means to end, the end being peace, but such is not service to God but service only to a facet of God’s being. Peace is not the goal; but God’s glory is. A square is a rectangle but a rectangle is not necessarily a square: God’s glory includes peace, but peace doesn’t always give tribute to God’s glory. At the end of the day, it is the coherent testimony of the Biblical text that must guide a Christian’s ethic. The Old Testament texts all point to the person and life of Christ- God’s revelation in full human flesh. And the climax of God’s revelation was a moment in which he subjected himself to the violence of human hands and commanded his disciples to put away their swords. Though armies of angels surrounded him, he never lifted a finger against those who perpetrated violence against him. He did this, not in the name of peace, but for the end purpose of God’s glorification. Which is to say that the Christian pacifist must allow for the (theoretical) possibility of violence as a Christian means. This is necessary. Because the Biblical narrative is not a dogmatic presentation for or against violence, but a story that tells of God’s glory coming about in his creation. And a story- as anyone who reads for a living can testify- is not dogmatic; it is nuanced. The Christian pacifist is dishonest to proclaim that God cannot be served through violence- or at least that he never has been. In the same breath as this admission, however, it’s important to understand that the Biblical narrative has brought the Christian community to a point where violence is no longer a testimony to the glory of God, in that it’s purpose was completed in Christ on the cross. The Christian calling is not to be peacemakers; it’s to glorify God. The former is idolization of a characteristic of God which, when placed upon the throne, can have destructive demands (“the ends justify the means”). The Christian is called to serve God in his entirety, not cherry-pick attributes and serve as we please. And the climax of God’s revelation was Calvary. From the cross, Christ disallows a sword in the hand of the Christian. As NT Wright once put it, the Christian story is not a power story, it’s a love story. Love poured out on all humanity, all creation, not to be negated or overlooked for any idol. Even that of peace. 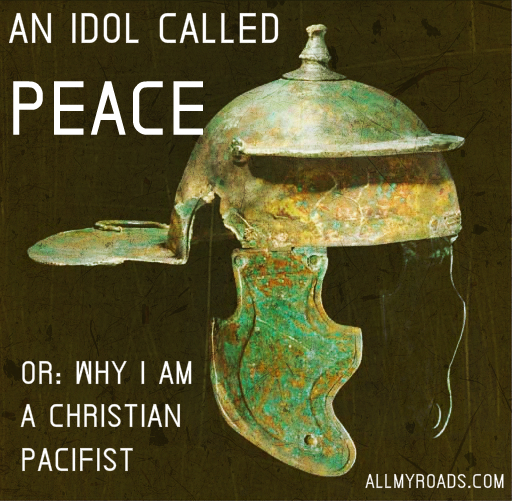 Christians are not called to serve an idol called “peace”. But we are called to serve a God whose climactic moment of revelation was the death of death. The story to be told in the Christian’s life is that we’ve no use for violence because we’ve seen God in the flesh and we behold his glory – not as one who fights death, but one by whom death is already conquered. Which is why I am a Christian pacifist. What does Jesus think about war? Previous Post Are You a Church-a-holic ?